It's time for another Top Ten Tuesday! 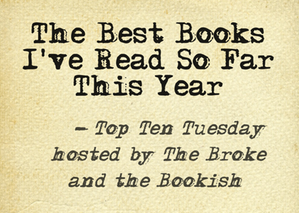 This time around we've been prompted to pick the 10 best books that we've read (so far!) in 2014. What are some of your 2014 favorites? The Storied LIfe of AJ Fikry just moved to the top of my list. Looks like a good one! Best thing I've read this year is Reconstructing Amelia. I haven't finished yet, but really enjoying it. Ugh, The Bear. The very idea terrifies me. Great list! I love these updates, it reminds me of titles I don't want to forget! I loved The Worst Hard Time. As a younger person, I didn't really like history, but as I get older my interest grows and that was a great book to spark the fire. I read The Rosie Project last year and it was a favorite of mine. Many others on your list are on my TBR, and I hope to read them soon, in particular The Bear, Newtown and AJ Fikry. Good list! I just picked up Shotgun Lovesongs from the library yesterday. I hope to start it soon. And The Worst Hard Time has been languishing on my bookshelves forever. I will have to bump it up a shelf. My unread books are organized by how much I want to read them. I really liked Hyperbole and a Half. The Worst Hard Time was a great read. The Rosie Project is on my list too! And Life After Life. I just picked up Dept. of Speculation at the library today - yay!! My TBR is already overflowing but if the Doctor's telling me I must read these I suppose I must. I've not read any of these including Animal Farm ( book shame) but have certainly heard of most. The Rosie Project is really as charming as everyone says?? lol Don Tillman never wrote The Rosie Project, but I don't think Graeme Simsion would mind. I really hope that was a joke rather than a typo because it makes a great joke. I haven't read any these, but they're exploding my wish list now. I've seen AJ Fikry all over the place today and The Bear sounds terrifying but powerful. Great list! I think I'll be adding Dept. of Speculation to my list! Shotgun Lovesongs is one of my Top 5 books of the year so far! I'm so glad to see someone else loved it too :) I thought Butler's writing made me think "yes, that's exactly how it is". Great picks, my Mum is always raving about The Rosie Project. I must read it! I'd really like to read The Rosie Project! I haven't read any of these books yet though many have received a lot of positive reviews.